Free online diagram software: flowcharts, mind maps, checklists, etc. Flowcharts in DrakonHub follow the ergonomic standards from the aerospace industry. These standards rid diagrams of the visual noise. Show the happy path with the skewer. Break up the diagram into its logical parts with the silhouette. Show implicit connections with the common fate. Add order to your mind maps. Make the structure of the diagram apparent at first glance. A well-visible structure will help the reader see how each item relates to its parent, siblings, and children. Dearth of order kills efficiency and destroys profit. Chaos in business annoys both the customers and employees. Eliminate the pandemonium with business procedures. Create visual business procedures in DRAKON. Your employees will know precisely what to do and when. Sketch the program before coding. Update the sketch during development. This sketch will give you the clarity that will accelerate your work. In half a year, the sketch will help you recall all the subtleties and complications of the program. Accumulate the records of your solutions to software problems. Get the developers to understand their tasks unambiguously. 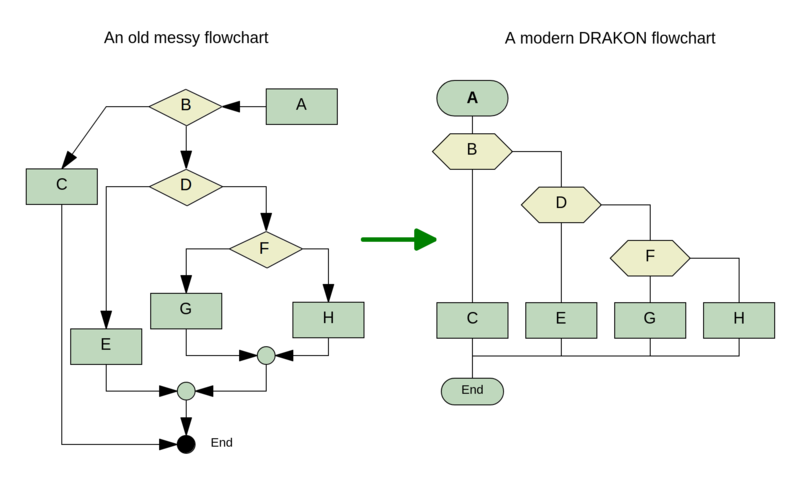 A DRAKON flowchart is a simple way to explain how a complex system will work. Diagrams document the knowledge about the project in a concise way. Keep the ownership of this knowledge, don't let the developers bury it in the source code. Even seasoned professionals have to learn new skills regularly. A vast amount of information is hard to read and understand. Remembering it is even harder. Visual summaries come to the rescue. A visual summary is a condensed essence of complex text in the form of diagrams. Such an essence shows the fundamental concepts and relations. Draw visual summaries in DrakonHub, study efficiently. Don't worry about lines. Add the boxes, and DrakonHub will draw the lines for you. Besides, there is no need for pixel hunting. Insert elements accurately with one click. DrakonHub takes care of alignment, centering, and spacing. The biggest strength is how quickly I'm able to sketch out my thoughts in a diagram. I do not have to worry about formatting or alignment. Even quick and dirty drawings get a perfect shape in minutes. The tool is smoothly pushing you to sort your punch of ideas in well-ordered wired way. Fantastic tool for creating complex diagrams in just a couple of minutes. It saves me many hours. 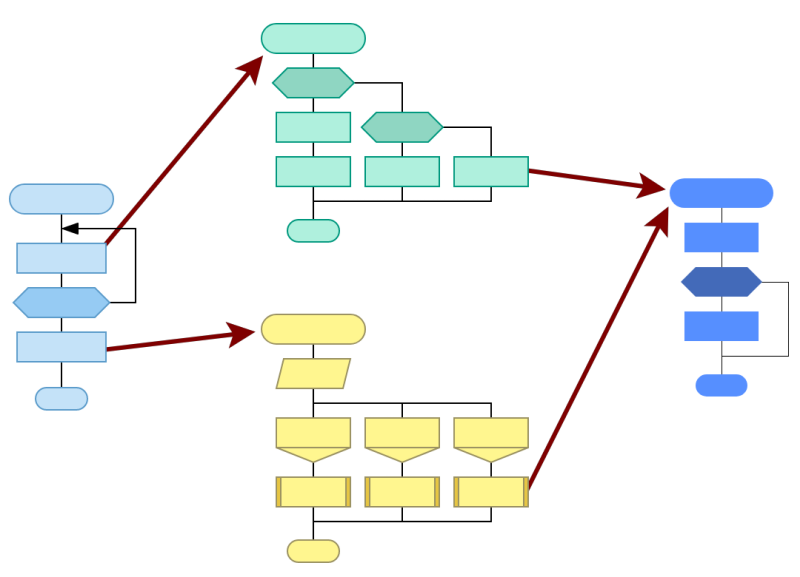 DrakonHub automatically creates links between diagrams. These links turn fragmented diagrams into an interconnected knowledge base. 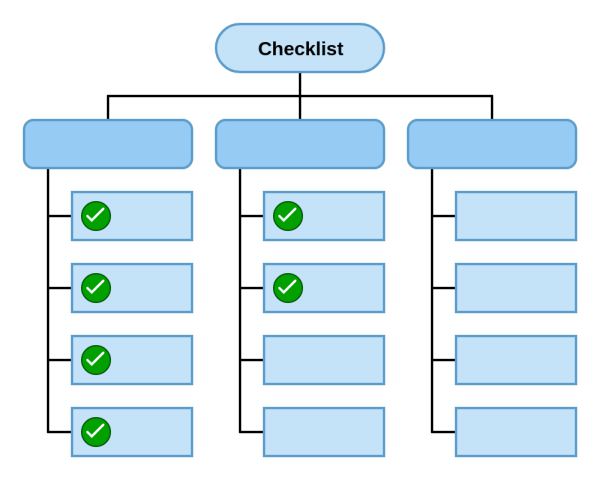 DrakonHub will turn any diagram into a checklist. Create either short or multi-part checklists. Your attention to detail will scare your peers. Forget what it means to forget to do something. Send a link to your diagram. Better show once than tell a thousand times. Edit diagrams with your colleagues in real-time. Draw diagrams on your phone everywhere and any time. Get the most out of your iPad and Microsoft Surface. DrakonHub runs in the browser, no need to install any app.